WITH rumours of war still disturbing the political atmosphere of Europe, and menacing to involve even England in the general conflagration, the question of recruiting troops for our army must of necessity again claim its share of public attention. That the system actually in force is radically wrong, few will attempt to deny; not that there is so much difficulty in obtaining recruits, but how are we to keep them in the ranks when once they have joined ? Our soldiers, it appears, run away at the rate of more than twenty-one a day; and there were no less than 7759 deserters last year. Nor is this all ; we should add the number discharged as bad characters, which seems to be increasing, for there 1616 men thus expelled from the army in 1870, and as many as 2025 in 1873; while the average number of men in prison in 1870 amounted to 1288 ; and this figure rose to 1914 in 1872, and fell to 1554 in 1873.. Finally, we should not omit cases of sickness, for we find that in 1872, out of an average strength of 92,218 men, the average number constantly in the hospital was 3628. Altogether, therefore, it will be seen that the recruiting sergeants. notwithstanding the remarkable success that attends their efforts, cannot unaided supply us with a good army. Indeed it must be wounding to whatever sense of honour they may possess, to find that so great a proportion of the recruits they bring to the ranks ultimately regret that they ever yielded to the sergeant's advice. These dissatisfied soldiers might of course have known that the recruiting sergeants were in business bound to present a roseate view of military life, and that the fault to be found with the army would not be disclosed by those who are so eminently interested in enlisting all who are capable of serving in its ranks. At the same time, it is only just to add that the degrading, immoral, and disreputable stratagems which rendered recruiting sergeants obnoxious to our forefathers are now entirely abandoned. Morally speaking, the modern recruiting sergeant would stand on the same level as the ordinary tradesman or business man, who seeks to sell a second-rate or questionable article, by carefully hiding its flaws, and exposing in the very best light whatever small merit it may possess. But the recruit enjoys at least the advantage of ninety-six hours to reflect, and, if he chooses, he can then withdraw from his bargain, on paying a comparatively small sum as "smart money." Recruiting in London is almost exclusively circumscribed to the district stretching between the St. George's Barracks, Trafalgar Square, and Westminster Abbey. Throughout London it is known that all information concerning service in the army can be obtained in this quarter, and intending recruits troop down to this neighbourhood in shoals, converging, as the culminating point of their peregrinations, towards the celebrated public-house at the corner of King Street and Bridge Street. It is under the inappropriate and pacific sign-board of the "Mitre and Dove" that veteran men of war meet and cajole young aspirants to military honours. Here may be seen every day representatives of our picked regiments. No modest lines-man is allowed on this beat; and, though nearly all the recruiting is for the infantry, the sergeants themselves belong to the cavalry - excepting, albeit, a few marines. These men are all well-known characters, and for the most part have been on this spot for many years. For instance, the most prominent figure in the accompanying photograph, standing with his back to the Abbey, and nearest to the kerb stone, is that of Sergeant Ison, who is always looked upon with more than ordinary curiosity as the representative of the 6th Dragoon Guards, or Carbineers - a regiment which of late has been chiefly distinguished for having included in its ranks no less a person than Sir Roger Tichborne himself! 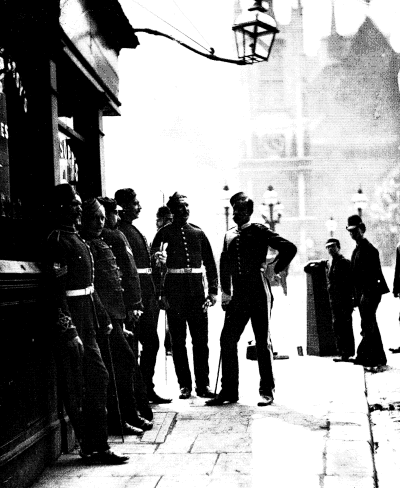 To the Carbineer's right we have the representatives of two heavy regiments, Sergeant Titswell, of the 5th Dragoon Guards, and Sergeant Badcock, of the 2nd Dragoons, or Scots Greys; the latter is leaning against the corner of the public-house. Close to him may be recognized the features of Sergeant Bilton, of the Royal Engineers, while Sergeant Minett, of the 14th Hussars, turns his head towards Sergeant McGilney, of the 6th Dragoons, or Enniskillen, whose stalwart frame occupies the foreground. This group would not, however, have been complete without giving a glimpse at Mr. Cox, the policeman, to whose discretion and pacific interference may be attributed the order which is generally preserved even under the most trying circumstances at the "Mitre and Dove." The boot-black is also well known to the neighbourhood, and he has doubtless occasionally helped with brush and blacking to enhance the spruce appearance of Her Majesty's troops. The amount of work done by the sergeants who loiter about at this corner may best be estimated by the fact that 3605 approved recruits were enlisted from the London district in 1875, and I need scarcely remark that the greater number of these men accepted the fatal shilling at the hospitable bar of the "Mitre and Dove." Henry Cooper, one of the best known and most successful recruiting sergeants, enlisted at this corner during the course of thirteen years upwards of 3000 men; and is generally supposed to have retired with a large fortune. I hear, however, and on good testimony, that this latter detail is altogether erroneous, and that, notwithstanding his prolonged and devoted services, Sergeant Cooper was obliged to resort to the vulgar expedient of a loan on leaving his corps. This last version has at least the advantage of according with the general characteristics of the English army, and harmonizes with that spirit of ungrateful neglect which allows Waterloo heroes to die in the workhouse. Recruiting sergeants have the credit of making large incomes, but insufficient account is taken of the expenses they are forced to incur. They receive a guinea for every man they enlist, and who, after the doctor's examination, is accepted as fit for service. This sum, however, must cover all expenses, and includes the shilling given to the recruit on his volunteering to join. But it often happens that men accept the shilling and are never heard of again. The sergeants have no right to retain them. The recruit may go immediately to the barracks if he chooses, but he can rejoin his friends if he prefers, and need only appear the next morning for the doctor's examination. Thieves and other dishonest characters consequently profit by this opportunity to obtain a shilling, which, of course, is never refunded to the deluded sergeant. A shilling is also lost every time a man is enlisted, and subsequently condemned by the doctor as unfit for service; it therefore frequently happens that men who possess some constitutional weakness constantly attempt to enlist, with a view to the shilling, relying at the same time on being discharged by the doctor. Hence the traditional shilling is a source of constant trouble and loss to the recruiting sergeants. There are also a number of men who are known as "bringers," because they make it their business to persuade men to enlist, and when in a ripe frame of mind bring them to the recruiting sergeants. The "bringer" then expects to share the profits, and the sergeant must hand him over 10s. out of his £1 commission. But it may ultimately be discovered that the recruit had already enlisted in another regiment; and the "bringer" having by that time disappeared, the recruiting sergeant loses the ten shillings he had given him, plus the shilling with which he pledged the false recruit, and the money and time expended in drink to celebrate this unfortunate stroke of business. Sergeant Burgess, of the 1st Royal Dragoons, who has succeeded to the post and popularity of Sergeant Cooper, to whom I have already alluded, related to me an amusing anecdote of this description. A corporal of the Guards once brought him a recruit, and consequently received ten shillings. The recruit, however, deserted, and Sergeant Burgess demanded that his money should be restored; but the corporal was in difficulties, his wife was ill, and finally his regiment left town before he had been able to refund the ten shillings. On the other hand the deserter was ultimately traced; he had enlisted again and was with a regiment at Athlone. Thereupon Sergeant Burgess was despatched to Ireland to identify the deserter. This trip cost the government £2 18s. travelling expenses; and Sergeant Burgess lost fourteen days, during which time he was unable, of course, to recruit a single individual; and was further out of pocket £5 spent en route, and in fraternizing with the Irish garrison. But misfortunes of this description are not the sole cause of loss and outlay. There is no suitable barrack accommodation for the London recruiting sergeants, and 3s. 6d "lodger money" is therefore allowed per week. This is supposed to compensate for the room, fuel, and light which should be given in the barracks. It is, however, difficult to get a suitable room in London under seven shillings per week, and three shillings is but a low estimate for coals and light. Besides this outlay, recruiting sergeants have to be better dressed, and wear out their clothes more rapidly than if they were in ordinary service; yet they have only one pair of boots, and of gloves, and one tunic allowed them per annum, the authorities stretching a point, and giving three pairs of trousers for every two years. As a natural result, the sergeants have to buy the greater part of their clothes, and this at no trifling expense. A good cap, for instance, costs £1 1s., and when exposed day after day without respite to the smoke, dirt, and rain of London, this important appanage to the uniform does not last longer than a year. The recruiting sergeants have, therefore, like every other branch of the service, a formidable list of grievances, and consider themselves far removed from the enjoyment of that good fortune which is generally attributed to them. Will the day never dawn when some patriotic reformer shall sweep away these grievances, throw the army open to all, render its rewards accessible to sterling merit alone, without regard for wealth, position, or family influence, so that the humblest English recruit may, like the soldiers of the Continent, hope to "carry a marshal's baton in his knapsack." If this could ever be accomplished; if it were possible to uproot the divisions of caste or class which destroy the harmony of our national defence, and render it as fashionable a distinction to be an officer as it is disreputable to be a common soldier, and if soldiers were not merely allowed on rare occasions to rise from the ranks, but all officers selected exclusively from those who had first served in the lowest grade-then the army would be ennobled from the poorest drummer-boy to the proudest marshal,- thousands of superior, brave, and steady men would throng unbidden to swell its numbers, and we should no longer need recruiting sergeants to cajole simple-minded and ignorant youths amid the intoxicating fumes that are the incense of the "Mitre and Dove."